Mac OS X El Capitan 10.11 Beta 4 (Build: 15A226f), OS X Server 5.0 Beta 4 (Build: 15S2186i) and Apple Configurator 2.0 Beta 4 for OS X developers has been seeded by Apple, with the official release of OS X El Capitan 10.11 Public Beta 2, OS X Server 5.0 Public Beta 2 and Apple Configurator 2 Public Beta 2 for OS X non-developers (general public users). 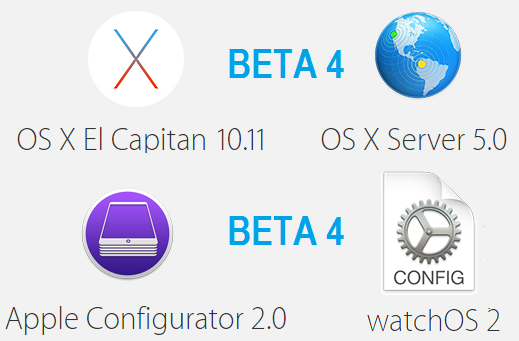 The OS X El Capitan 10.11 Beta 4 Download Links for Mac devices are available. The changelog of OS X El Capitan 10.11 Beta 4 pre-release version contains; addition of several performance, stability and security fixes, revamped mission control with split screen and bugs fixes. You can also read Known Issues of OS X 10.11 Beta 4 in below image! How to install OS X 10.11 Beta 4 without Developer Account? To get fast and instant OS X El Capitan 10.11 Beta 4 Update, head-over to Mac App Store >> Software Update option. Mac OS X developers can get OS X El Capitan 10.11 Beta 4 (15A226f), OS X Server 5.0 Beta 4 (15S2186i) and Apple Configurator 2.0 Beta 4 through OS X Dev Center website; Alternatively, OS X developers can free activate OS X 10.11 Beta 4 without UDID with iTunes manually. Mac OS X El Capitan 10.11 Beta 5 is also expected soon by Apple.